Your vehicle’s transmission is more than just an ancillary car part — it’s one of the major players in the operation of your car. Working on transmissions can be a painstaking and challenging process — not a project for the inexperienced weekend mechanic or the faint of heart. Don’t leave your car’s transmission to just anyone — take it to the professionals. 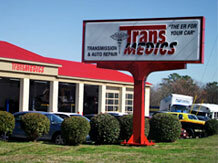 TransMedics has been a leading source of transmission service and maintenance in Raleigh for more than a decade. And, should your transmission need more than just routine maintenance work, TransMedics also offers transmission repairs, retrofits and rebuilds and new transmissions. Working on transmissions is our bread and butter. After all, we’ve built our business on superior transmission service. To have our certified technicians work on your car, contact TransMedics today online or call (919) 954-8699. Our basic diagnostic is free of charge and no appointment is necessary. Call today! TransMedics provides transmission service on most foreign and domestic automobiles from our auto shop in North Raleigh. Drive to us from Wake Forest, Rolesville, Knightdale, Durham, Cary and beyond!